Hwange shines – The Trophy Reaffirms and Endorses Turnaround Strategy. 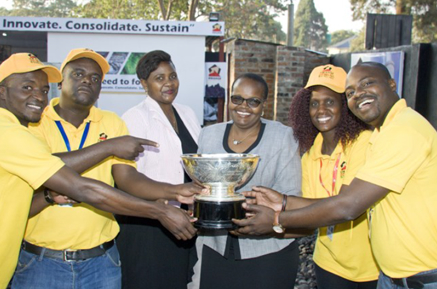 The events and exhibition team is excited to have won the Harare Agricultural Show Society – Best Sustainable Mining Trophy awarded to the Best Mining Company showcasing the most Sustainable Mining Practices and Best Corporate Social Investment. The show ran from August 21 -26, 2017 at the Zimbabwe Agricultural Show Grounds in Harare. The trophy sponsored by Fidelity Printers and Refiners Private Limited was handed over by the organisation’s General Manager Mr Fradreck Kunaka. Speaking after receiving the trophy from the Head of State and Commander in Chief of the Zimbabwe Defence Forces, Cde Robert Mugabe, HCCL Commercial Manager, Dr Beauty Mutombe says she is excited to have won the trophy. Dr Mutombe attributed the success to teamwork and support from everyone within the organisation with special mention to all employees, entire management team and the board for the ongoing turnaround. Corporate Affairs Manager, Rugare Dhobbie says the award has put Hwange Colliery Company in the limelight for good reasons reaffirming the turnaround strategy the company is implementing. “Winning the trophy by its very nature restores confidence, spruces up and promotes good image of the company brand, in this case the HCCL brand is flying high on the market,” she said.